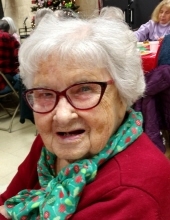 Jane C. Doyle, age 94 years, passed away on Wednesday, March 27, 2019 in the Hunterdon Care Center, Raritan Township, NJ. Born in Brooklyn, NY, March 31, 1924, she was the daughter of the late Francis and Jane McCullough Colligan. She was a homemaker. Mrs. Doyle was as member of the Delaware Township Seniors and the Hunterdon County Republican Club. She was predeceased by her husband, Francis H. Doyle, in 2011, her son, Edward Doyle, in 2016, and her four siblings. Surviving are two sons, Thomas Doyle of Glen Cove, NY, and Hugh Doyle of Sergeantsville, NJ; four daughters, Margaret LaPadula of Chestnut Ridge, NY, Jane Doyle of South Attleboro, MA, Kathleen Doyle of Oregon, and Frances Hamilton of Stockton, NJ; thirteen grandchildren; and fourteen great-grandchildren. A Mass of Christian Burial will be celebrated on Monday, April 8, 2019 at 10:30 AM in St. Magdalen Church, 105 Mine Street, Flemington, NJ. Interment will follow in St. Magdalen Cemetery. Calling hours will be held on Sunday, April 7, 2019 from 3-5 PM in the Holcombe-Fisher Funeral Home, 147 Main Street, Flemington, NJ. "Email Address" would like to share the life celebration of Jane C. Doyle. Click on the "link" to go to share a favorite memory or leave a condolence message for the family.